Whoever wins, I think the real champion of the Super Bowl is “Super Bowl.” Generation after generation, the roots of super and bowl have been moving their linguistic chains down the field. But before we look at their etymological playbook, why did the Super Bowl even take that name? In the late 1950s, there was a National Football League and an American Football League, and, by the late 1960s, the winners of each league came to play a championship game. (Eventually, they merged into a single league, now known as the NFL.) And that championship game needed a zingy game. Legend goes that Lamar Hunt, then owner of the Kansas City Chiefs, witnessed his kids playing with Wham-O’s bouncy ball toy, the Super Ball. When officials were looking for an appropriate name for the final championship, Hunt is said to have suggested, jokingly, the “Super Bowl,” based on this toy. Though it met with some resistance, the name stuck by the third Super Bowl in 1969. Now with more Zectron! 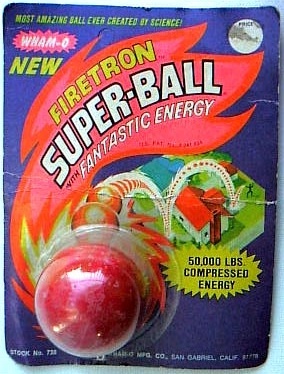 Image courtesy of superballs.com. This is a super story, but college football championships were being called “bowls” long before the Super Bowl. In 1914, a football stadium for the Yale Bulldogs went up in New Haven, Connecticut. 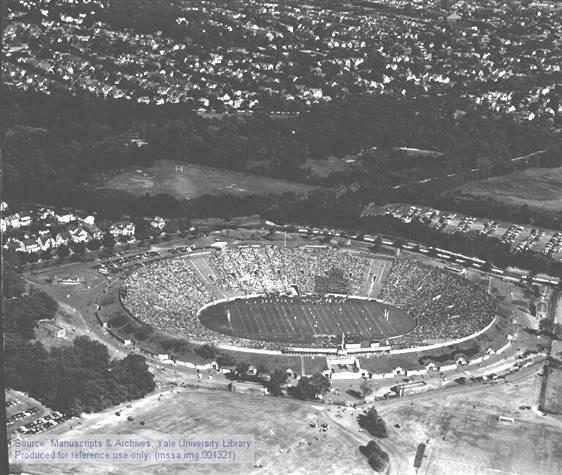 It looked a big bowl, and so it came to be called the “Yale Bowl.” This stadium inspired the Rose Bowl stadium in Pasadena, CA, whose famous game came, too, to be called the “Rose Bowl” in 1923, thereby cementing the tradition of calling postseason college football games as “bowls.” Hunt may have pulled “Super Bowl” out of his bowler, but it’d be hard to deny any influence of these bowls on his associations. A very bowl-y Yale Bowl. Image courtesy of Yale University Library. It turns on bowl and ball just don’t sound a like. They have an etymon in common. Super really is a super word. It’s a very functional adverb: “That exam was super hard.” It’s perfect fodder for compounds: superman, supercharged, superpower. It’s a swell adjective, to boot: Super Committee, Super Bowl. (It’s easy to see how this adjective becomes a prefix). These uses, variously meaning “excellent” via “above” or “beyond,” are dated back to the first part of the 19th century. But super is super old. English picked up super from the Latin, super, a multipurpose adverb and preposition meaning “on top,” “above,” and “over,” to name a few. Bowl is handed down from the Middle English bolle, in turn from Old English’s bolla. Etymologists from Skeat to Weekley broadly suggest an ultimate origin in the Proto-Indo-European *bhel– (and its family of variations), meaning to “swell.” Proto-Germanic’s *bul– (“round vessel,” the Online Etymology Dictionary offers) helps provide the connection. This root *bhel– has a lot of fans. In Greek, it took on forms to give English such words as: phallus and chlorophyll (the element –phyll, is from the Greek for “leaf”). In Latin, it produced flos (yielding everything from “flower” and “flour”), follis (source of “follicle”), and folium (origin of “folio” and “foliage”).